You can pick your friends, but never your family and that is what’s great about our brothers and sisters. Our siblings are our best friends for life. We may fight and pick quarrels with them, but in the end we make up with little to no losses on either side, because we love each other unconditionally. So when the time comes for our siblings to move away for school or to protect our country, the leave behind a void that no one can fulfill. We know they will eventually come back to stay, but until then, we feel their absence and it makes us sad. That is probably why there are so many homecoming surprise videos out there – there is no greater surprise than to see that they have come home sooner than expected, to rid us of the misery. This is one such heartwarming video that we love to watch over and over. This girl’s brother has been out of town for undisclosed reasons, but he decided to surprise her just in time for her birthday. 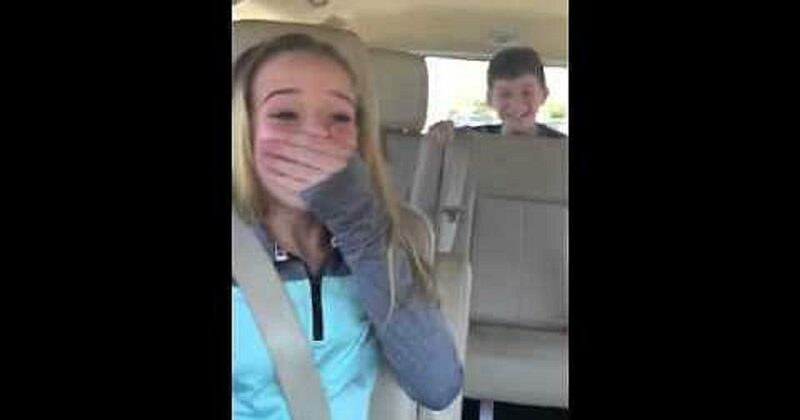 Their mom was the only one who knew about the surprise, because she was supposed to take her out for a birthday ice cream treat, with the big brother hiding in the trunk of their car. One high pitched scream and loads of tears later means that the surprise was a total success and everyone can finally go for some celebratory ice cream!